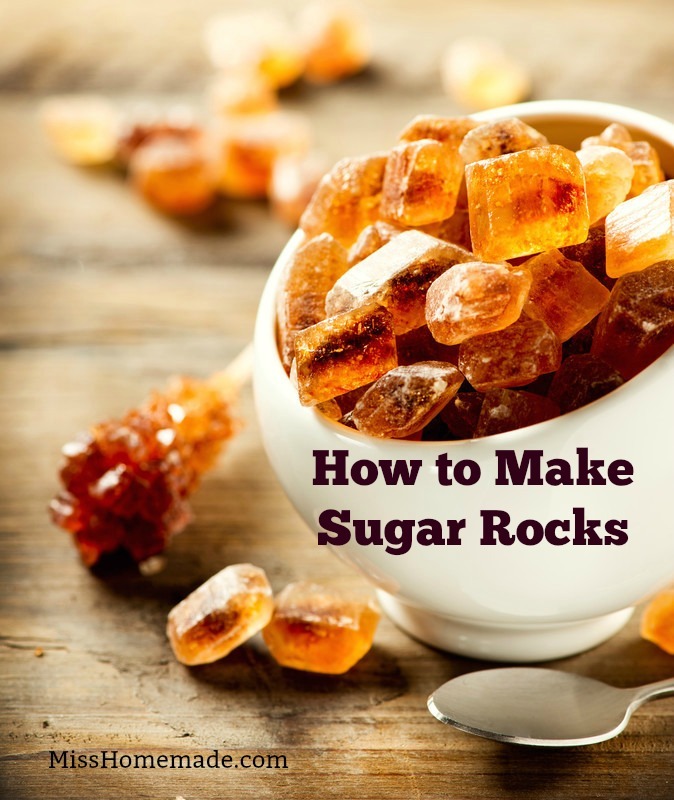 Make Crystal Rock Candy and personalize flavor, color and even shape. 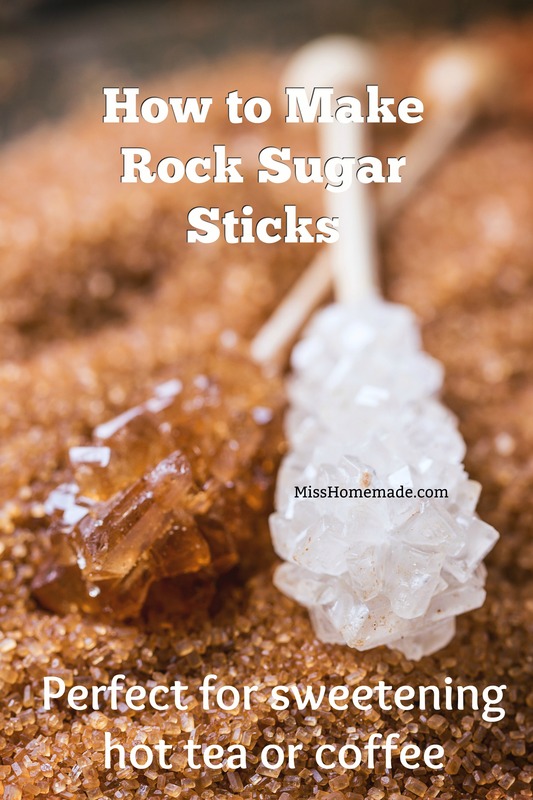 You can make them into sugar rocks or sticks to sweeten tea or coffee. Your children can even get involved because it does take a few days to make the sticks. Prepare your materials: wash a glass jar thoroughly with hot water to clean it. Cut a length of thick cotton thread a few inches longer than the height of the jar, and tape it to a pencil. Place the pencil across the lip of the jar, and wind it until the thread is hanging about 1 inch from the bottom of the jar. Attach a paper clip to the bottom of the thread to weight it and ensure it hangs straight down. Alternately, you can use a wooden skewer as the base of your rock candy, and use clothespins balanced across the top of the jar to clip it into place. Place the water in a medium-sized pan and bring it to a boil. Begin adding the sugar, one cup at a time, stirring after each addition. You will notice that it takes longer for the sugar to dissolve after each addition. Continue to stir and boil the syrup until all of the sugar has been added and it is all dissolved. Remove the pan from the heat. If you are using colors or flavorings, add them at this point. If you are using an extract, add 1 tsp of extract, but if you are using flavoring oils, only add ½ tsp, and make sure you don’t stand right in front of the pan—the scent can be very strong as it rises in the steam. Add 2-3 drops of food coloring and stir to ensure even, smooth color. Allow the sugar syrup to cool for approximately 10 minutes, then pour it into the prepared jar. Lower the sugared string or skewer until it hangs about 1 inch from the bottom. Carefully place your jar in a cool place, away from harsh lights, where it can sit undisturbed. Cover the top loosely with plastic wrap or paper towel. You should start to see sugar crystals forming within 2-4 hours. If you have seen no change to your skewer or thread after 24 hours, try boiling the sugar syrup again and dissolve another cup of sugar into it, then pour it back into the jar and insert the string or skewer again. Allow the rock candy to grow until it is the size you want. Don’t let it grow too large, otherwise it might start growing into the sides of your jar. Once it has reached the size you want, remove it and allow it to dry for a few minutes, then enjoy or wrap in plastic wrap to save it for later. To see photos of the process geared towards children making it click here. Take 2 and a half cups of water and bring it to a simmer on your stove. Take 3 cups of regular granulated sugar and mix until dissolved in the simmering water. You don't have to put it on a stick or in a jar like you did above. If you want big chunks of hard rock candy, make it as shown, but place it on a cookie sheet. Wait for it to cool, then break it with a small mallet. In about a week all the water will be evaporated and all that will be left is rock sugar. Want another idea for homemade gifts or beverage sweeteners? Try my sugar cubes from scratch at the link below.